We received a comment on May 1st, 2018 that Ion Assault was relisted on Xbox 360. No recent Archive.org or Google Cache captures exist to identify a more accurate date but the game has indeed returned for sale in North America, Europe, and Japan. On February 17th, 2019 we received another comment that the game had been relisted on Steam. Checking SteamDB it looks like the game officially returned on January 18th with THQ Nordic as the new publisher. 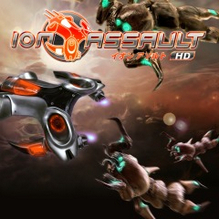 Ion Assault remains delisted on PlayStation 3. Ion Assault was last confirmed available on Xbox 360 on November 22nd, 2011 and delisted no later than December 19th, 2011. On Steam it was delisted on May 23rd, 2015. The date that the PlayStation 3 version was delisted is unconfirmed but as the game was released on that platform in 2013 it is assumed it was delisted in 2015 alongside the Steam version. “In ION ASSAULT HD the player controls thousands of ion particles that he can use to blast, fry and blow up anything off the screen! SOLID GAMEPLAY WITH A TWIST: By focusing the gameplay on its unique fluid and particle physics system, ION ASSAULT HD adds a special twist to the classic arcade-style space shooter!